Rated 4 out of 5 stars by 6 PRO members. Lockheed SR-71 Blackbird Package for FSX. 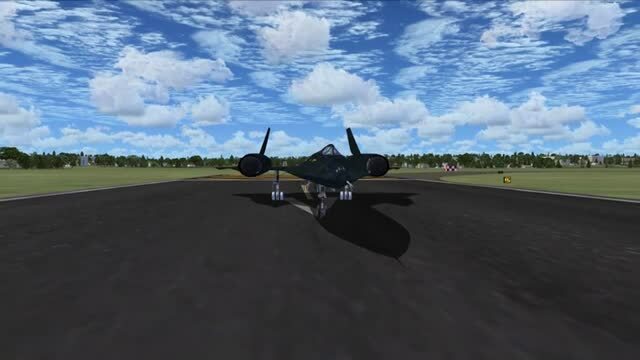 This is an update of the GMax Academy SR-71 so it will run in FSX without problem. This is the best freeware SR-71 originally design by Stephane Masset et Pierre Marchadier for FS2004. Now updated to work with FSX with all incompatible gauges replaced with FSX XML gauges. The package include complete aircraft with VC and 2d panels. Modified for FSX by Danny Garnier. The archive xsr71.zip has 89 files and directories contained within it. Unless you are brand new to the world of aviation and flight simulation, you will no doubt have heard of Lockheed Martin at one stage. As one of the premium names within aviation and military aviation, they are a name that is pretty common even if you couldn’t name one of their aircraft. For simulation and aviation fans, though, you’ll be more than familiar with their work and the scale of the projects they take on regularly. Well, as a fan of many of their creations over the years I was especially excited to try out this latest offering. By giving you the chance to jet off into the skies using an awesome Lockheed Martin SR-71 Blackbird aircraft I was finally able to fulfill that dream of being “that” kind of pilot. Instead of flying a classy big jetliner over the sea, I was able to create a far more engaging process by hopping into the breakneck speed creation here. Updated from the ever-popular Gmax Academy projects in the past, this has been optimized and managed to run in FSX without any problems whatsoever. This means that the attention to detail and the realistic features will come together perfectly just as they did if you ever used this mod in the past with FS2004. I’ve done a lot of reading into the Blackbird over the years, and finally getting to fly one properly was one of the most enjoyable things I’ve ever done in a flight simulator. Nothing is more enjoyable than hopping into that cockpit and jetting off knowing that you are flying something that could topple and entire city in the wrong hands. The stunning addition of all the right little spoilers and additions, even the striking red lines that run along the body of the aircraft, makes sure that it looks every bit as realistically as it feels. Speaking of how it feels, this is an aircraft that can blitz through the skies without any problems whatsoever; just as the real thing is known for, this can hit incredible speeds that you will not be particularly used to flying at. To make this feel more realistic than ever before, though, the Blackbird brings all of the virtual cockpit features that you could possibly need to make the flight as enjoyable as it can be. With instruments and features you’ve probably never even been using before, you’ll find that flying this aircraft can be an incredibly enjoyable experience for both newbies and veterans. The attention to detail in the design is absolutely incredible. This makes it easier than ever before to just take off and see the world around you without ever really feeling you are flying in a set of pixels. By giving you all of those features, and all of that detail it’s very easy to start believing that you are engaged in the real thing! Like any good simulation add-on, it thoroughly adds to the experience and acts as the perfect basic education on Blackbird aircraft. I downloaded this file and installed it to find none of the controls match the fax system. I get one panel view with very few interactive controls. Any suggestions? When I pull up the autopilot it just shows a blank window with no buttons or anything. Must be missing something, but the airspeed indicator is rather limited and there is no Mach Meter. Could only get a top speed of 400 mph. Is there a way to kick the afterburners on? I stalled out at 40 000 ft and don't know how to get afterburners on so didn't go fast for me , anyone have a solution? I can not install the aircraft. I copied everything in the root, but unfortunately nothing happens? How should I do? What a great effort by the creator of this plane - it brought a great smile to my face when I saw how great it looks. Two problems though: 1. How does one get the drogue-Shute to deploy? 2. Why isn't there a shut-down sequence sound file for use when one shuts off the engines? Please give feedback to andre.ludick@transnet.net if anyone has a solution? I can't seem to stop after I land on the runway. Does this plane have thrusters (F2) It is going way too fast even with full flaps on. Any ideas ? Tough to slow down and can't figure out the parachute yet but over all great plane fun to fly and FAST!!!! Great sim of the real thing. Spent time at Kadena while in the USMC with F-4's. We were pulling R&R there for 30 days. We were next door to the Habu, less than a hundred feet away, and this sim holds true to the real Ichi Bon. I dont remember the flag around the two step snake, just the snake's body was on the tail in red, with the words Ichi Bon (#1) in bold caps underneath. Fly's like a dream, very smooth. Brake shute pops, canopy's work, flight deck needs some work with gauges, but all in all, a great addition to your Air Force. Don't pass this one up. Great Looking aircraft. The flight deck needs some work.